Gypsy’s “Truckstaurant”—a hybrid eatery set inside an old warehouse that feels like something between a food truck and a restaurant—is certainly a fun one, and oh, so, Charm City. The Truckstaurant is situated along a sketchy strip of the Clipper Mill corridor and tucked behind some barbed wire and an automotive junk yard/car repair place. The outside dining area, with a tented Ping-Pong table and several al fresco tables for those balmier Bawlmer days, sets the stage for the playfulness that’s to come. 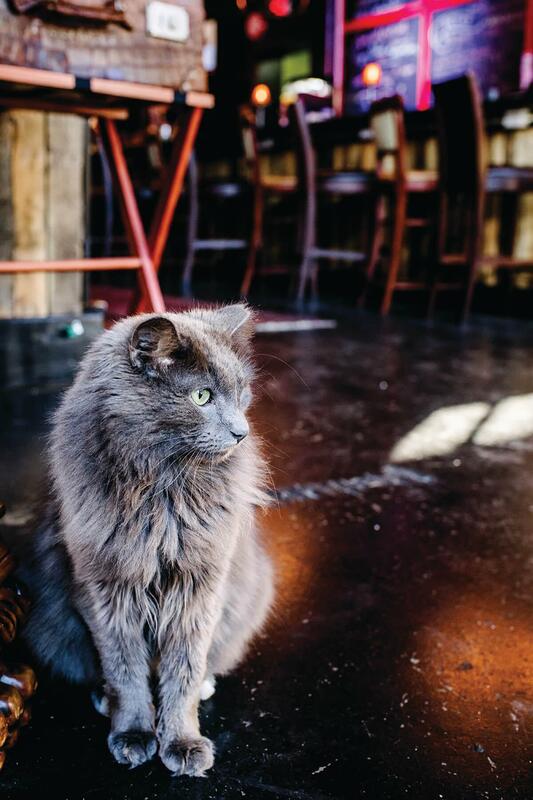 Inside, there’s a friendly feline who graces the entrance and welcomes tummy tickles. 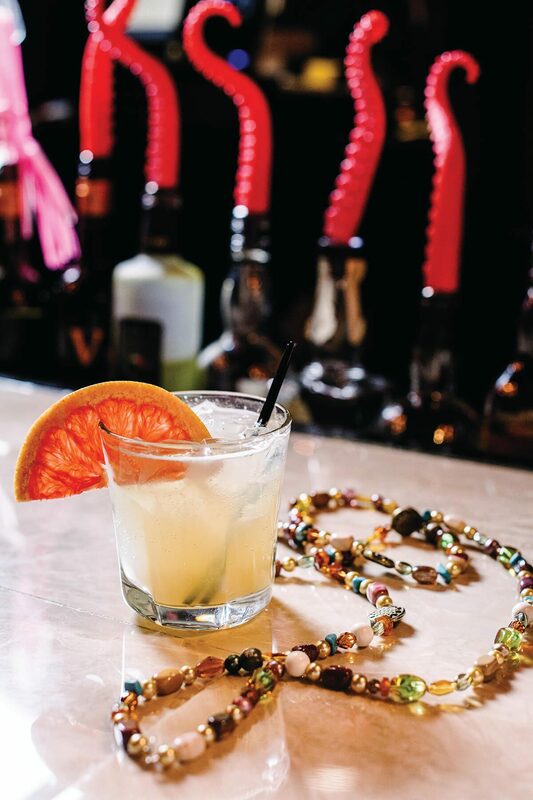 The 90-seat or so dining room features a large and beckoning bar with drinks you won’t see anywhere else (strange, but true, on offer is a swirled combination of frozen red sangria and orange margarita). A whirling disco ball is suspended from the ceiling, and on Wednesday “Disco Night” there’s ’80s music to go along with it. 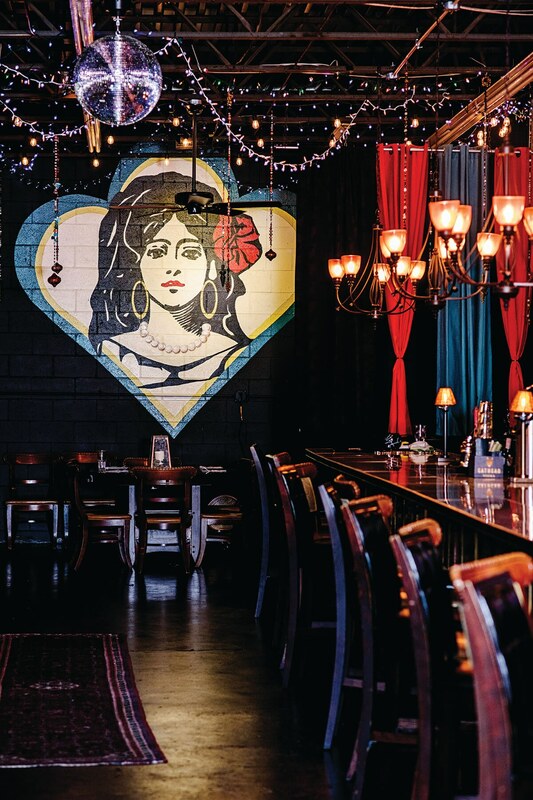 A hand-painted portrait of the titular gypsy queen fixes her gaze on diners from the back wall, and there’s an arrangement of green, pink, blue, and orange bottles that act as a room divider and add a sculptural element to the space. In other words, the joint has atmosphere to spare. After nine years of running a food truck, owners Tom Looney, Annemarie Langton, and Ed Scherer (formerly of Helen’s Garden in Canton) decided to get back into the brick-and-mortar business. But while they have the ambiance and the décor down, the kitchen (actually inside the permanently parked food truck) has, well, some miles to go before the concept completely works. 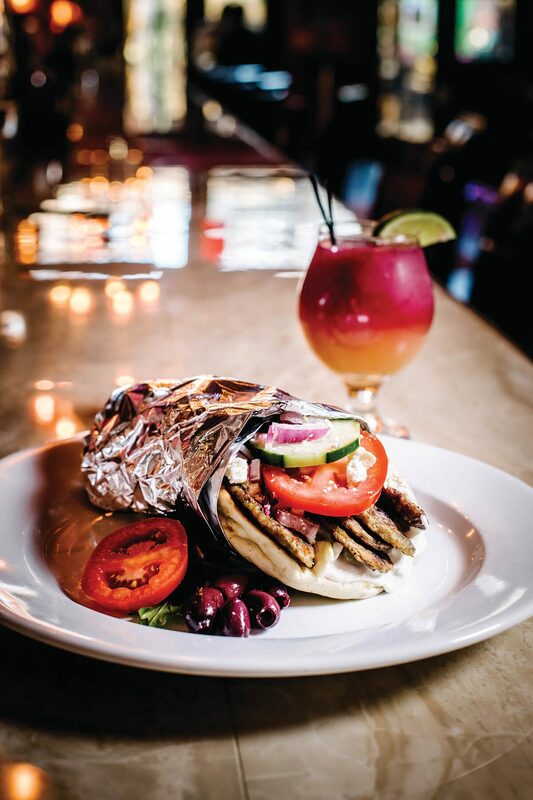 The gypsy theme carries through to the menu, as it wanders—at times aimlessly—from Thailand (peanut noodles) to India (curried chicken and rice with naan) to Greece (lamb gyro) to Vietnam (pork banh mi) to Maryland (crab cake BLT) to the Middle East (curry basil falafel sandwich). Some of the global street food offerings come straight off the café menu (the cones, the burritos)—and that’s when the fare is at its best. cake drizzled with a delicious house-made aioli and sitting on top of a mound of crispy fries, all of which gets rolled into an actual sweet waffle cone, defies all culinary logic—but don’t question it. Accept that it’s delicious and it works. The Thai chicken burrito listed under the “carne” section of the menu is an Asian-Mexican mashup that’s also a classic from the cafe menu. With its lettuce wrap-style ground chicken and accompanying spicy seasoned slaw, it’s a bit messy to eat but quite tasty. Also, in the sandwich section, the lamb gyro is good enough, though the shawarma-style lamb could use more seasoning and spice. The bacon brown butter burger with cheddar is a dependable crowd pleaser. The downfall of the menu is that, when it veers from the time-tested truck fare and relies on decades-old dishes from Helen’s Garden such as seafood Newburg, it doesn’t work. Overall, the kitchen needs to tighten up as well. A Greek salad had all the right components but was drowning in inches of dressing. The warm spinach-artichoke and gorgonzola dip had an unfortunate paste-like consistency (note to chef: blend less) and was served with water crackers that didn’t enhance it in any way. (Something heartier like toasted baguette slices would have worked better.) The fish taco with slaw was tasty, but unremarkable. Ditto the curry basil falafel sandwich, which had no hint of the aforementioned curry or basil. While friendly, service could be stronger. On one of two visits, I ordered the falafel salad with harissa and tahini dressing. Instead, when it arrived, the falafel had been replaced by a mound of caramelized cauliflower, but our server said nothing to us as he placed it on the table. “We were out of falafel, I didn’t know,” is all that he offered when we inquired a few minutes later. The Truckstaurant is certainly unique and fills a niche for something a little daring and different in a neighborhood of other originals like Woodberry Kitchen and Birroteca, each the first of its kind when it opened. I admire its pioneer spirit and think that with some tweaks, and by focusing on what it does well—and getting rid of what it doesn’t—it should keep on trucking. GYPSY’S TRUCKSTAURANT 3515 Clipper Mill Rd., 443-869-5602. HOURS: Tues.-Thurs. 11 a.m.-9 p.m., Fri. 11 a.m.-10 p.m., Sat. noon-10 p.m., Sun. 3-9 p.m. PRICES: Starters, sandwiches, and cones: $8-18; entrees: $13-28; desserts: $10. AMBIANCE: Truck-stop casual.